The latest Smoke has a write-up of London's only subaquatic bus route, the 108 (Stratford-North Greenwich-Lewisham), and by my reckoning one of very few that pass the same point 3 times during their run. Anyway, the article briefly mentions the Millennium Busway, built to speed passengers from Charlton station to the Dome. Having no recollection of what this engineering marvel amounts to and finding little online, I decided to take a look while I was in East London yesterday. The answer: not much. Here it is on a map. Very nearly three quarters of a mile of, well, bus lane, stretching all the way from North Greenwich station to North Greenwich Odeon. The northern half runs adjacent to one of the Dome's gridlocked access roads and has no stops - the only building it passes is this isolated pub with a terrace of houses behind it. 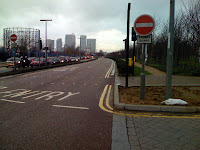 The southern half runs around the back of Greenwich Millennium Village (where there are two lonely stops), then terminates at a junction with Bugsby's Way (pictured). Buses cross from here into the retail park with that Millennium eco-Sainsbury's. Then it's out onto normal streets. Under the "Millennium Transit" plans it was intended that buses on the route would be guided electronically, following a buried cable, but the technology was abandoned before public service commenced, partly because of safety concerns. The busway is now used by ordinary buses to get passengers to North Greenwich station slightly quicker, but one day will be part of Greenwich Waterfront Transit, and far in the future that could be converted to trams, finally fulfilling the busway's destiny. The Millennium Busway has two of the most pointless sets of traffic lights known to man, where buses frequently wait for up to a minute while absolutely no traffic whatsoever crosses their path. Well it annoys the hell out of me, anyway. The problem is that the busway and the normal roadway are the wrong away around - if the roadway was on the right-hand side, you'd lose at least one set of traffic lights. Nobody seems to think that delaying buses by up to three minutes (yes, that long) while cars whizz by is a problem, though. If only there were a direct bus. I decided to verify your statement that the 108 is the only sub-aquatic London bus route, having journeyed through the Rotherhithe Tunnel dozens of times in the '90s when I lived in SE16 on the P14 or the ELL replacement (last time round) route ELT. And indeed the P14 is no more; what's more I've discovered that its half-arsed replacement, the 395, is also deceased. So I checked TfL's website to see what replacement buses will operate during the forthcoming ELL closure, and it appears there will be no cross-river replacement bus services at all. Admittedly the Jubilee line exists now, and the cross-river DLR, but I'm still surprised that an ELT-style replacement hasn't been proposed.